Remember my October Horrorthons? Of course you don’t! Why would you? I apparently don’t. Around the time I was reviewing horror movies for this Horrorthon, a movie review was requested of me by friend of the reviews Kendra that I never got around to. And then it never really felt like a good time to review a horror movie because it was no longer October. She probably forgot that she requested it. I know that I forgot about it for a while. But then it popped back into my head and I realized that I should not try to wait until October to knock this one out. Let’s do this! 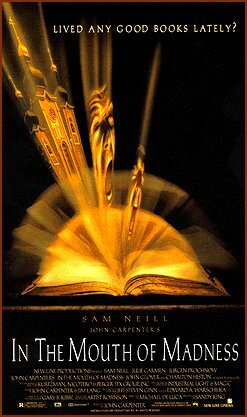 The movie is In the Mouth of Madness, written by Michael De Luca, directed by John Carpenter, and starring Sam Neill, Jürgen Prochnow, Julie Carmen, David Warner, Charlton Heston, John Glover, Frances Bay, Wilhelm von Homburg, and Bernie Casey. John Trent (Sam Neill) is a patient in a Looney bin that recounts his story to Dr. Wrenn (David Warner). Trent worked as an insurance investigator who is hired by the director of Arcane Publishing, Jackson Harglow (Charlton Heston), to locate popular horror novelist Sutter Cane (Jürgen Prochnow). At first, Trent is not interested. But he then inexplicably decides to buy all of his books and read them, giving himself nightmares. And that is exactly the reason that any rational person would take up the case! Also, he cut up the covers of the books and found a map that only people in this movie can read because it just looked like a collection of various book covers to me. Anyway, it leads Trent and Linda Styles (Julie Carmen), editor of Cane’s books, to a town that doesn’t exist called Hobb’s End – the place where Calvin’s tiger died – where they find that Cane’s books are coming to life. Uh … why did I watch this? I don’t say that because this movie was “bad” per se, but I don’t really understand how this movie became requested. The movie feels like it intends to be deep and psychologically scary, but was really only a slight step up from a regular “gore and makeup” horror movie. I started thinking negatively of this movie right in the beginning as the movie opens with the most 80’s, Karate Kid-style rock music. What have I gotten myself into? And then it got into a lot of its nonsense. Like the whole situation with the agent trying to kill Trent with an axe and Trent talking to Harglow and Styles about how he thought it was a publicity stunt. A publicity stunt? That guy is dead now! How much did he believe in Cane’s new book that he’d take part in a publicity stunt that ended with him being dead? Trent says a lot of stupid things in this movie though. Near the end, he makes the claim that “every species can smell its own extinction.” What are you basing that on? How many now extinct animals have we interviewed about what they can smell? And what does extinction smell like? I like to think it smells like White Diamonds. And then it gets into the story, which isn’t that interesting but felt like it really wanted to be. Is the book causing all of this? (Probably) Does Cane have super powers? (Sure) Is Trent crazy? (Seems to be) Do I care? (No, not really) And then the movie ends with Trent in a movie theater, watching the movie we just watched like the horror movie version of Blazing Saddles. I wasn’t really impressed with the performances in this movie either. Sam Neill gave a good enough performance, but it felt like he was not good enough at hiding his accent yet. He has one on the realsies, right? Well, if not, he talks weird. Also weird: his character keeps a squeaky horn in his glove compartment, specifically to wake up passengers that fall asleep while he’s driving? That’s odd. Especially since these vehicles actually have built-in squeaky horns of their own. I spent the greater majority of the movie trying to decide if I wanted to bang Julie Carmen. By the end of the movie, I decided that I wouldn’t kick her out of bed, but I also wouldn’t actively pursue it. The only thing I really thought about her character was that she must’ve been SUPER dedicated to her job. I know she’s Cane’s editor, but does that necessarily entail that she memorize every detail of his books? She knows which direction the church is from the hotel in a made up novel. Unless there’s a map or he just spends a lot of time describing the layout of the towns in his books, there’s really no reason to do that. When I saw Frances Bay in the movie, I recognized her but didn’t know from where. I thought she was the rapping grandma at first, but then I realized she was a grandma, but a grandma for Happy Gilmore. That made me so happy. She’s good too. In Happy Gilmore, she was a sweet old lady that you wish was your grandma, and she starts out that way here, but shows some range too.